Wildman has a birthday coming up. And he LOVES George! So a Curious George birthday was in order. A longall made from red pique with a great big 2 on the front. Featuring George of course. I used Children's Corner "William and Winnie" again. It goes together in a snap and fits great. it was the requested trick or treat bag. It matches the one I helped Momma make for Princess three years ago. I didn't have a pattern or tutorial, just the dimensions of the first bag. Momma couldn't remember where the pattern for the first one came from. ::sigh:: Not sure it is a complete match, but close enough. The drippy font came from an Etsy shop. Here. A project that didn't take long, took longer to find the font than anything else. I am sure he will enjoy it. They better trick or treat in Italy is all I have to say! What are you working on faithful reader? My children and their friends once wanted to dress up as ghosts and go Trick or Treating. Disaster! This is absolutely socially unacceptable here. It was extremely embarrassing for all concerned. Visualize a group of children going to houses where people do not speak good English, have no gifts to present, are strangers to the children, big dogs barking, while an adult tries to explain to the children that nobody is going to make this turn into a Hollywood movie scene. This custom is not to be encouraged ever. Never go to somebody's house and expect strangers to give your children something unless you have already provided everything for them to do so. A substitute which is popular and acceptable is to hold a fancy dress party at home. No danger. Less encouragement of bad habits. No stupid candy or horrible food colouring!!! The children can run about and have some fun with each other and still feel special. Martha, I am certain Hank will LOVE his Mimi mades! I am working on pillows for Christmas and some quilted jackets....my brands don't wear smocking, so I am learning new ways to sew for them. 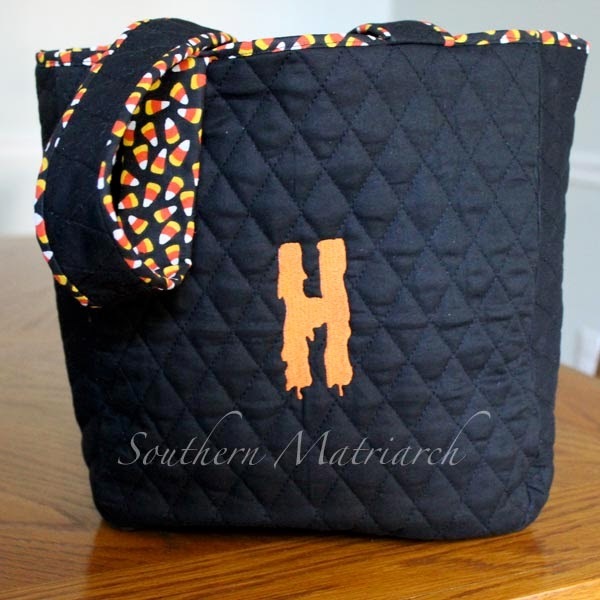 The trick or treat bag is darling! Precious outfit! 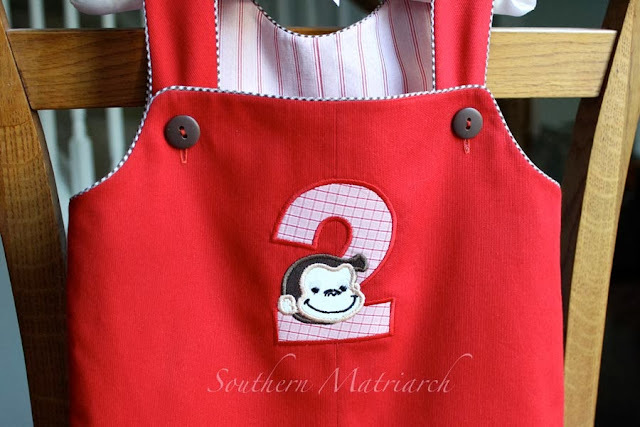 I always wanted to make something for Georgie boy with a Curious George theme. Did you make the pants to snap up the legs or sew them up? 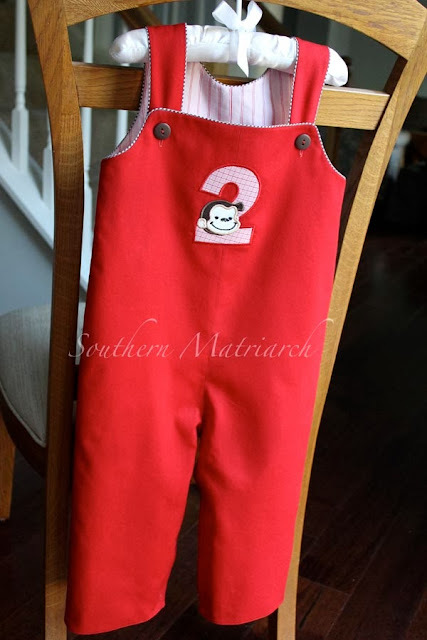 I'm getting ready to make three Johnny long alls? What do you think of that pattern as I've never made it before. The trick or treat bag is darling! Cheryl, the legs do have snaps. And the fit of this pattern is great. Wildman has several Johnny longalls as well. Momma loves them. 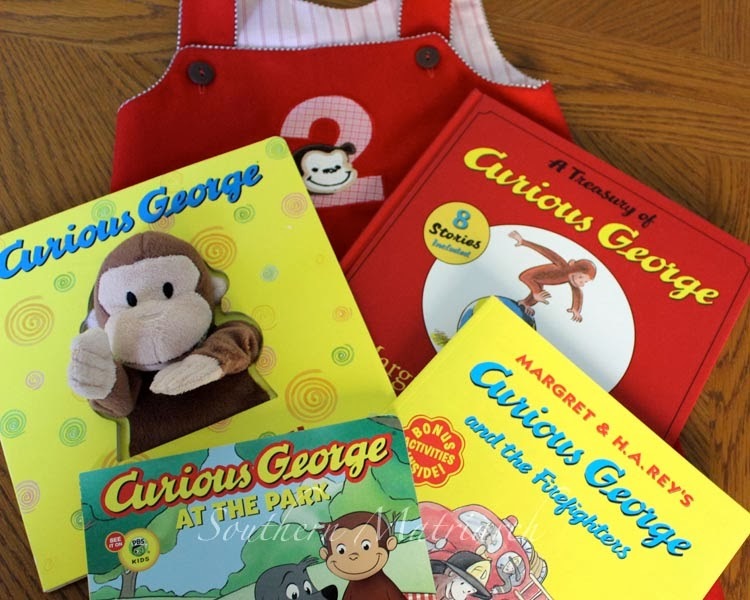 That Curious George is adorable! 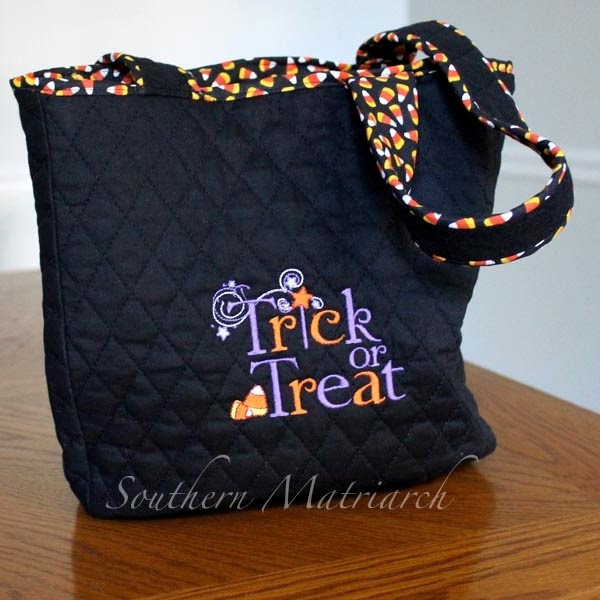 I made a trick or treat bag for my granddaughter and already shipped it off without photographing it.